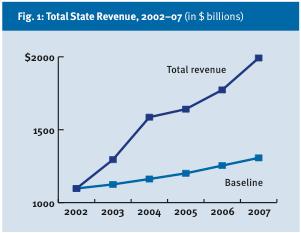 Over the entire period, real per-capita revenues rose 22%. On the graph, you can clearly see the 2001-2002 and 2008-2009 recessions. If we go peak to peak in the last business cycle, 2001 to 2007, the growth was 13%. If we go trough to trough, 2002-2009, the growth was 9%. Notice that even from the peak of the previous business cycle in 2001 to the trough of the current business cycle in 2009, real per-capita revenues were still up 6%. So the recession is clearly not the proximal cause of the state and local budget problems. State and local government agencies have more inflation-adjusted dollars per person today than they did at the peak of the boom in 2000. Their revenues are consistently growing. The problem is that they can’t get their damned spending under control! 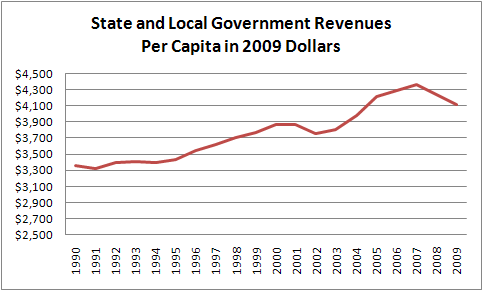 * State and local government tax revenue from this Census Bureau data. 2000-2009 population estimates from here. 1990-1999 from here. Ironically, 2010 population data is not yet available so I couldn’t generate a per-capita datapoint for 2010. I used the CPI-U series for inflation. I did all the analysis in this spreadsheet file. My wife has an Art History degree from Princeton. However, she often has excellent insights into economics. So I think either (a) one of the reasons she fell in love with me is that she’s a latent economics geek or (b) she loves me so much that she actually pays enough attention to my economics ramblings that some of it rubs off. About a year ago, she came up with a solution to the “employee union problem”. With the recent public employee union showdown in Wisconsin, I thought I should share it with you. What’s particularly ironic is that she’s out in front with some pretty serious economists in thinking about issue. For example, check out this Wall Street Journal article by Robert Barro, a Harvard professor and author of my undergraduate macroeconomics textbook. Most people think that unions are simply workers exercising their rights to band together. Actually, this isn’t the case. As Barro points out, unions are a monopolies that are specially exempted from anti-trust law. Moreover, the government actually enforces their monopolies. The key law here is the National Labor Relations Act (NLRA) as administered by the National Labor Relations Board (NLRB). The NLRB protect the rights of employees to collectively “improve working terms and conditions” regardless of whether they are part of a union. In addition, the NLRB can force all employees at a private firm to join a union, or at least pay union dues. This process is called “certification”. Once a union is certified, it has the presumptive right to negotiate on behalf of all employees at the firm, and collect dues from them, for one year. After that, it is possible to “decertify” a union. However, the union usually has enough time to consolidate its power and then use it to keep the rank and file in line. When you have monopoly power, you have the opportunity to abuse it. In fact, there’s a whole government agency devoted to investigating such abuses: the Office of Labor-Management Standards. UnionFacts.com has helpfully collated the related crime statistics for 2001-2005. Assuming that only a fraction of abusive behavior faces prosecution, these statistics are pretty sobering. Of course, federal, state, and local government employees are exempt from the NLRA. You might think this exemption is a good thing for limiting union power. However, what it means in practice is that each level of government is free to offer special treatment to their employee’s unions without oversight from the NLRB. As you can imagine, the politicians and public employee union leaders get nice and cozy. The politicians give the unions a sweet deal and the unions give politicians their political support. Everybody wins. Except ordinary citizens. Personally, my solution would have been to completely eliminate the government-enforced monopoly of unions. However, I admit this blanket approach could swing power too far towards management in some industries. My wife’s solution is better. She says the unions can get monopolies, but only for a set period of time. Say 3 or 5 years. From an economics standpoint, this approach is really insightful. First, it removes union leaders’ incentive to form a union just to accumulate power. It will all go away pretty soon. Second, it prevents originally well meaning union leaders from getting corrupted over time. Pretty soon they’re ordinary workers again. Third, it does provide help to those workers who feel management is truly abusing them. They can form a union and get better treatment. When the union’s existence terminates, they can still bargain collectively, just not exclusively. If management tries to screw them again, they will have the example of how to work together. An economist would call this “moving to a better equilibrium”. I’ll admit this solution isn’t perfect. Some management abuses will slip through the cracks. But I’m pretty confident they’ll be less extensive than the current union abuses. It’s also probably better than my original thought of banning unions altogether. And there’s some small chance my wife’s approach would actually be politically feasible. Nice work, Jane! 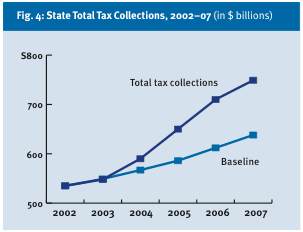 You may recall my two posts on the California budget back in May 2009. I just haven’t had the heart to dive back into this issue again, even though it’s obviously timely. However, I though it was worth mentioning this article in Reason Magazine highlighted in one of today’s Coyote Blog posts. When times were relatively good, the money was flowing in. So we went on a spending binge. When we hit the recession in 2008, we discovered that this level of real, per-capita revenue was not permanent. But by then, a bunch of people had been accustomed to getting their money from the states and it was hard to cut them off. One budget watchdog estimates that the states are in a combined $112B budget hole for 2012. As you can see, if we’d stuck to our 2002 baseline, we’d have accumulated plenty of surplus during the good times to plug this hole. But asking a state to save money is like asking an addict to go without a fix. Previously, I used my Production Function Space (PFS) hypothesis to illuminate the differences between startups, small businesses, and large companies. Now, I’d like to turn my attention to the implications of PFS on a firm’s demand for labor. I don’t know about you, but a lot of hiring behavior baffles me. I see companies that appear clearly and consistently understaffed or overstaffed, relative to demand for their offerings. Then the hiring process itself is strange. I’ve consistently seen companies burn all kinds of energy and incur all sorts of angst just to come up with a job description. Shouldn’t it be obvious what isn’t getting done? Why do they delegate apparently core aspects of production to contractors? And despite decades of evidence, why do firms insist on using selection procedures like unstructured interviews that aren’t very effective. Also, there’s the mystery of why incentive-based pay doesn’t work in general despite plenty of evidence that humans respond well to incentives in other circumstances. Can the PFS hypothesis shed any light? I think so. But this hypothesis implies that a firm’s labor decisions are substantially more complicated than we thought, so don’t expect a nice “just-so” story. Uncertainty. The payoffs from searching PFS are uncertain. In many cases, they’re really uncertain. You could end up with a curious but unmarketable adhesive or you could end up with the bestselling Post-it notes. You could end up with just another search engine or you could combine it with AdWords and end up with Google. A search over a given region is essentially a call option on implementing discovered production functions. Specificity. Economists refer to an asset as “specific” if its usefulness is limited primarily to a certain situation. The classic example is the railroad track leading up to the mouth of a coal mine. I think employees searching PFS are fairly specific. Each firm’s ability to exploit production functions is rather unique. Google and Microsoft can’t do exactly the same things. Moreover, each firm’s strategy for exploring PFS is different. So it takes time for an employee to “tune” himself to searching PFS for a particular firm. All other things being equal, an employee with 3 months on the job is not as effective at searching PFS as an employee with 3 years. And an employee that leaves firm A will not be as effective at searching PFS for firm B for a significant period of time. Think of specificity in searching PFS as a fancy way of justifying the concept of “corporate culture”. Network Effect. The number of people searching a given region seems to matter. I’m not at all sure if it’s a network effect, a threshold effect, or something else. But there seems to be a “critical mass” of people necessary to search a coherent region of PFS. You need a certain collection of skills to evaluate the economic feasibility of a production function. The larger a firm’s production footprint and the larger the search area, the greater the collective skill that is required. Let’s start with hiring and firing decisions. As you can see, firms face a really complex optimization problem when choosing how many people to employ and with what skills. Suppose demand for a firm’s products suddenly declines. What’s the optimal response? Due to the the network effect, firing x% of the workforce reduces the ability to search PFS by more than x%. Due to specificity, this reduction in capability will last much longer than the time it takes to rehire the same number of people. Thus, waiting to see if the drop in demand is temporary or permanent provides substantial option value. Of course, a small firm doesn’t have much cushion, so may have to lay off people anyway. Thus I predict a sudden drop in demand will result in disproportionately low or significantly delayed layoffs, and the disproportion or delay will be positively correlated with firm size. Moreover, firms will tend to concentrate layoffs among direct production workers to minimize the effect on searching PFS. This tendency may explain why they delegate some apparently core functions. Being able to flexibly adjust those direct costs preserves the ability to search PFS. This hypothesis implies that the more volatile the demand for a firms’ products, the more they will outsource direct production. Conversely, what should a firm do if demand suddenly increases? Based on the PFS hypothesis, I have three predictions: the firm will (1) delay hiring to see if the demand increase is sustained, (2) “over hire” relative to the size of the demand increase, and (3) hire a disproportionate number of people outside of core production. The reason is simple, diversification. Due to uncertainty, the best way for a firm to ensure its long-term survival is to have a large portfolio of ongoing PFS searches. Extra dollars should therefore be allocated to PFS searching labor rather than capital or direct production labor. However, because a firm knows that it will be reluctant to fire in the future, it will initially be conservative in deciding to hire. It seems like these predictions should be testable. I wish I had a research assistant to go through the available data and crank through some econometric analysis. I’m thinking the next step is to work through the implications of PFS searching on employee behavior. Unless anyone has other thoughts.